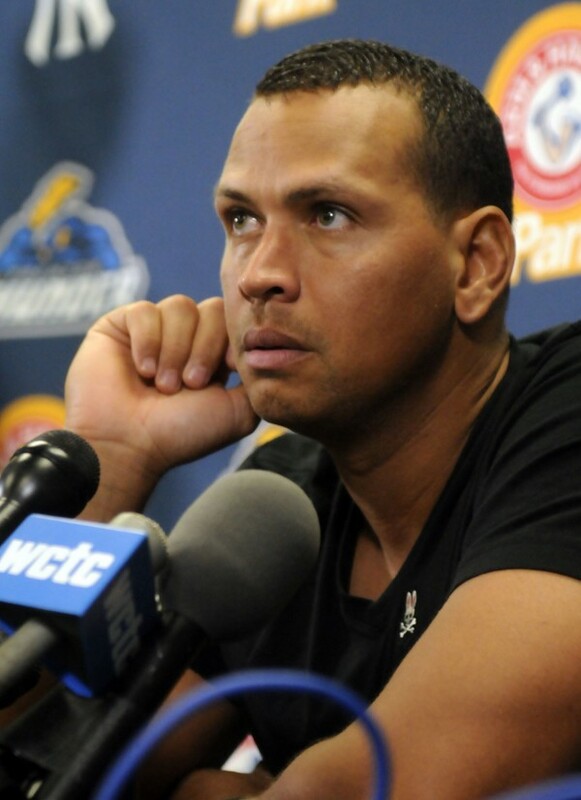 New York Yankee's Alex Rodriguez listens to a question at a news conference after playing for the Trenton Thunder in their rehab minor league baseball game against the Reading Fightin Phils in Trenton, New Jersey, August 3, 2013. Detroit Tigers Jhonny Peralta (L), Texas Rangers Nelson Cruz (C), and San Diego Padres Everth Cabrera are among 12 Major League Baseball players that have been handed 50-game suspensions following a long investigation into links between top players and a Florida clinic accused of supplying performance enhancing drugs. CHICAGO — Alex Rodriguez is back with the New York Yankees, and with him came a circus-like atmosphere. Rodriguez, who is appealing Major League Baseball’s 211-game suspension for his involvement with the Biogenesis clinic, was activated from the disabled list and was set to hit fourth and play third base Monday as the Yankees face the Chicago White Sox. The press box at the ballpark, usually half-filled to cover the last-place White Sox, was packed to capacity. Fans waited outside U.S. Cellular Field to see the former American League MVP arrive, and when he did, he waved. His return overshadowed Mariano Rivera’s last series in Chicago and even Derek Jeter’s latest trip to the disabled list. Monday’s game will be just the latest moment in Rodriguez’s strange trip. Once one of baseball’s shining stars, Rodriguez has gone through numerous controversies and spats. In the past year alone, Rodriguez has been benched during the postseason, undergone hip surgery, fought with the Yankees over his future and the health of his quadriceps, and been a focus of one of sports’ biggest drug investigations. In January, Rodriguez had an operation to repair a torn labrum in his left hip, but that wasn’t what most were asking him about. All anybody wanted to know was about his suspension and his decision to appeal on a day when 12 other players accepted 50-game bans related to their involvement with Biogenesis. The now-shuttered South Florida clinic allegedly provided the players with banned performance-enhancing substances. Rodriguez said there was a lot that went into his decision, but he didn’t say much more. Rodriguez’s problems are far from over. It’s unclear when his appeal will be heard and what the outcome will be. In truth, Monday was just another bizarre day in the life of Rodriguez. As for the team, Girardi said Rodriguez will be in the lineup as long as he’s available. “It really doesn’t change anything for us,” the manager said of Rodriguez’s suspension and appeal. “If he’s healthy and he feels good, we expect him to be productive and I’m going to play him. While Rodriguez took center stage, not everybody at the ballpark was overly concerned with the slugger’s exploits. Some, like White Sox general manager Rick Hahn, are consumed with other issues, namely his team’s 10-game losing streak. “You’ve seen this team play recently. I’ve got 99 problems and A-Rod ain’t one of them,” Hahn said. Earlier Monday, a dozen players saw the evidence Major League Baseball had against them in the Biogenesis investigation and chose not to appeal 50-game suspensions announced Monday. Rodriguez, who was suspended a total of 211 games through the 2014 season, is digging in his cleats and intends to fight. MLB commissioner Bud Selig announced the suspensions Monday, highlighted by Rodriguez’s ban, which is categorized as violations of the Joint Drug and Prevention and Treatment Program, as well as the Basic Agreement, for his role in the Biogenesis scandal. Twelve other players, including Texas Rangers outfielder Nelson Cruz and Detroit Tigers shortstop Jhonny Peralta, accepted 50-game suspensions and will sit out the remainder of the 2013 regular season. Rodriguez’s suspension is longer due to the league’s belief he used banned substances over the course of multiple seasons and mislead investigators when previously questioned. Norberto’s suspension will be effective immediately once he signs with another Major League organization. All other suspensions are effective immediately. MLB also issued a statement saying Toronto Blue Jays outfielder Melky Cabrera, Oakland Athletics pitcher Bartolo Colon and Padres catcher Yasmani Grandal have already served 50-game suspensions as a result of their connections to Biogenesis and will not receive additional discipline. The league also found no violations by Washington Nationals pitcher Gio Gonzalez or Baltimore Orioles infielder Danny Valencia. Other than Rodriguez, the suspended players, including Milwaukee Brewers outfielder Ryan Braun, who accepted a 65-game suspension last week, can return for the postseason or the beginning of next season. The players union reached out to MLB on Monday in a final attempt to negotiate down the length of Rodriguez’s suspension, according to ESPN, but was told by the league there would be no more negotiations. Selig was reportedly furious when Rodriguez told reporters following a rehab game on Friday that he believed the Yankees and the league wanted him banned so he wouldn’t receive the $95 million remaining on his contract, meanwhile his representatives were attempting to negotiate with MLB to trim the length of the suspension. MLB officials responded by rejecting Rodriguez’s request to negotiate a suspension settlement as talks broke down Saturday, a league source told the New York Daily News. “However, we are compelled to address certain reckless and false allegations concerning the Yankees’ role in this matter. The New York Yankees in no way instituted and/or assisted MLB in the direction of this investigation; or used the investigation as an attempt to avoid its responsibilities under a player contract; or did its medical staff fail to provide the appropriate standard of care to Alex Rodriguez. If Rodriguez had accepted the suspension, he would have lost $34.5 million in salary — he is due to earn $25 million in 2014 alone. But he is still due $61 million from 2015-17, as well as a possible $30 million in bonuses. Rodriguez is a three-time AL MVP and 14-time all-star. He has missed the entire 2013 season after undergoing surgery on his left hip. In July he also suffered a strained quad that has delayed his season debut. He played two games over the weekend with Double-A Trenton on a rehab assignment. Rodriguez’s appeal will be heard by a new arbitrator, Frederic Horowitz, a lawyer from Santa Monica, Calif. Horowitz was hired as the replacement for Shyam Das, who was fired after his decision to overturn Braun’s initial 50-game suspension last year based on a chain-of-custody dispute with his drug sample. As for the other 12 players suspended Monday, several accepted responsibility for their ties to Biogenesis. The Rangers were reportedly surprised by Cruz’s decision Monday, but the outfielder also admitted to using PEDs to help recover from losing 40 pounds due to a gastrointestinal infection in the 2011-12 offseason. “By the time I was properly diagnosed and treated, I had lost 40 pounds,” Cruz said, per MLB.com. “Just weeks before I was to report to Spring Training in 2012, I was unsure whether I would be physically able to play. Faced with this situation, I made an error in judgment that I deeply regret, and I accept full responsibility for that error. I should have handled the situation differently, and my illness was no excuse.